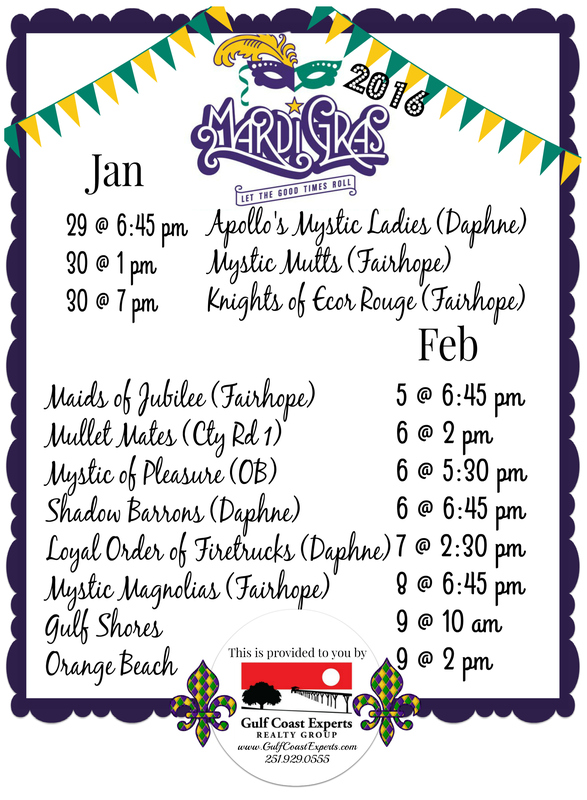 It is hard to believe it is that time again, the Eastern Shore Mardi Gras season starts this month! 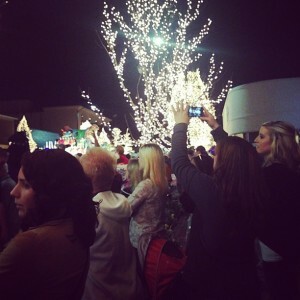 This year the festivities are starting earlier than in recent years. The date for Mardi Gras or Fat Tuesday is determined by Ash Wednesday. Ash Wednesday marks the beginning of the religious Lenten season that leads up to Good Friday and Easter. Mardi Gras is actually the day before Ash Wednesday but this celebration has grown into a season that last several weeks before the actual day. There are many ways to enjoy the Mardi Gras season but very few are as well-known and enjoyable as attending a parade. Parades are typically organized by one Krewe with multiple floats, jazz musicians, local high school marching bands and of course the Krewe’s King/Queen for that year. Here on the Eastern Shore of Baldwin County, attending a parade is truly a family event. Outside of our region the reputation of Mardi Gras parades can lead to raised eyebrows, especially when you mention you are taking small children. Most people outside of the Alabama Gulf Coast see it as one large adult party. To those of us who call the Eastern Shore our home, we know that our parades are more about seeing the beautifully designed floats, trying to catch some great “throws” and spending time with family and friends. 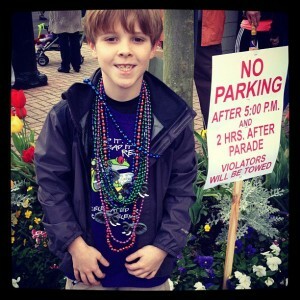 There are multiple parades scheduled in Baldwin County each year and start as far as two week before Fat Tuesday. For most of these parades, you will need to come a few hours before the start time. 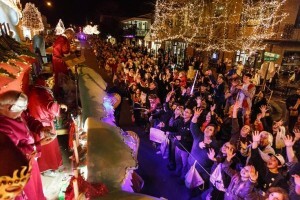 The city officials close streets on the parade routes early to begin putting up the baracades. It is not uncommon to see camp chairs lining the sides of the streets in anticipation of the floats making their debut. You can find smiles all around as you take in the celebratory atmosphere of the event. You definitely don’t want to forget a bag to carry all of the “throws” you’ll catch. Of course there are beads and lots of them. You will see them in all shapes, colors and sizes. Many Krewes are known for having specially designed beads that commemorate their particular parade. You will also see cups, doubloons, stuff animals, footballs, swords and the well-known favorite on the Eastern Shore – Moon Pies! So don’t miss out on an opportunity this Mardi Gras season to enjoy in all the fun. Spend time with old friends, maybe meet some new ones and definitely walk away with some goodies! Find below a list of all parades happening this year. Laissez les bons temps rouler from Gulf Coast Experts!